Over the last few months there has been some concerned feedback in some parts of the community about how Ubuntu is focused more and more on attracting new users to Ubuntu by providing a streamlined and simplified user experience. Much of this is being achieved with Unity; a new desktop interface delivered in Ubuntu 11.04, which will continue to be refined and improved upon based on user testing and feedback. One key piece of feedback from some Unity users was a concern around the lack of configurability in Unity, and a feeling that it is a little too simple and does not expose enough of the system, for which many more expert Ubuntu users enjoy. One take-away amidst this feedback is that the general focus of Ubuntu is evolving. While traditionally we set out to provide the simplest and easiest to use Ubuntu desktop environment, and this has not changed, this focus is become more and more prevalent as we shave off more and more rough edges on Ubuntu to make it ready for the prime-time. The problem is…some folks don’t want to loose the lack of configurability and control as we move towards the prime-time. This is perfectly valid and reasonable feedback. Fortunately, I think we can have the best of both worlds. Let’s first take a step back and let me explain how I think we can deliver an awesome system for both the mums and dads of the world (end users who are resistant to complexity and configurability) and power users (users who want to tune and optimize their system around their specific needs). Most people, even expert and power users, will typically only care about a particular layer and just want the other layers to work. As an example, a Kernel fan just wants his/her desktop to work without any poking, but wants all the power and configuration potential afforded at the Kernel layer. Speaking personally, I just want my Kernel and Foundations layer to work, but I am really interested in the GNOME layer. In other words, we want the things we don’t care about to just work, and we want the full scope of control in the layer we care about. Here Unity is designed to hide all of the complexity of the underlying layers. Unity is instead designed optimize the user experience for what most end-users need; finding and starting apps, finding files, managing windows, installing new software, seeing when notifications appear etc. If we base our assumption that there are these two broad types of user we want to satisfy here (end users who are resistant to complexity and configurability, and power users who thrive on configurability), I believe we can satisfy both by delivering a simple system optimized for the former out of the box, but then build tools and community to allow power users to add the configurability they desire post-installation. I believe that power users are better equipped to build on a simple default installation than end users simplifying a more complex and configurable default installation. One of the most wonderful elements of Linux is that in the vast majority of cases, power user orientated functionality is already exposed under the covers on the system (e.g. you can tweak Compiz setting with CCSM, you can re-compile your kernel if you like, you can tweak hard drive parameters with the terminal etc), it is just not exposed by the GUI. Joanne Bloggs installs Ubuntu 11.10 on her computer. She is presented with a simple default experience, but she desires more configurability. Joanne discovers an Ubuntu Power Users community where she can engage with like-minded power users who like to hot-rod their Ubuntu systems. As part of that community, configuration kitchen-sink tools and functionality is created and packaged inside the Ubuntu Software Center. Joanne is really interested in configuring Compiz and desktop effects so she installs an ubuntu-expert-desktop package to get this additional functionality (this package would install an expansive control panel of options for her, possibly inside a unified configuration application). In a few clicks Joanne is now part of a community of like-minded power users, complete with the additional configurability she desires. Providing a place for power users to communicate – I am sure the Ubuntu Forums folks can help with this, and an IRC channel (#ubuntu-experts?) and mailing list could be a great place to encourage people to participate. Document configuration functionality – the team could work together to explain how users with a free Ubuntu system can trick it up for this extended level of functionality. Provide tools – I think it could be awesome for this community to produce tools and package existing tools so they are only a click away in the Ubuntu Software Center. A good first step here could be a PPA. Unfortunately, I don’t have a huge amount of time to contribute to this community, and I think it would be great if some folks who are interested could step up to form a team to lead this work. I would be happy to provide some guidance and mentorship to those experienced in leading such a team. So, anyone interested in leading such a community and making this vision happen? Let’s have a discussion in the comments and make some plans! UPDATE: A mailing list has now been set up, and I recommend anyone with an interest in these more advanced Ubuntu needs joins the list. I would also like to encourage packagers and programmers to join to see how some of the ideas outlined in this post could be discussed and built-upon (e.g. a series of configuration packages in a PPA or Ubuntu Software Center). UPDATE II: THIS TIME IT’S PERSONAL: There is now a #ubuntu-power-users channel on freenode. I agree, many people look forward to this Power Users Community. This is a pretty grand idea. It would be neat to have a set of tools people could use to tweak their system. I’m very fond of Ubuntu Tweak for that very reason, though I do like to dig into the command line once in a while. A power user community maybe a good source to collection various tweaks and add-ons for the Ubuntu desktop from the wider Internet and sort the useful one from the ones the bullocks your computer. After the power user community grows, a community designed and supported package would be the next step. Also, with the emphasis on QA this release cycle. A Power user community would be a good resource for Ubuntu devs to use during the QA process. I would love to follow along. Perhaps after I finish this degree, I could participate. Meanwhile, I would gladly document some of the aspects of an Ubuntu Power User Community and try to help draw participants via the Ubuntu Unleashed book. I think this is a great idea! The Ubuntu Power User Community would be also a great place to experiment with new ideas, features, etc. I think many experienced Ubuntu users would be happy to be involved in this new team. The basic idea sounds wonderful. But one aspect finds my disapproval: There are at least three kinds of users, not two. 1) The normal user who needs only a desktop with which he/she can work. This user is not well versed in cimputer skills despite those that are needed for the daily work. But then there is 3) The user whose skills are situated between those of no. 1 and 2. This user has a specific workflow, perhaps he/she uses several virtual desktops, specific applications and knows about the possibilites of how to use software to modify the configuration of the desktop. Still, despite these abilities this special user does primarily work with a computer. It is not a hobby and thus this user does not want to spend more time in front of a computer screen than necessary. For this kind of user one needs an easy gui to modify the configuration. To compile a kernel or a configuration file requires time. Sometimes one has to read a manual or tutorial. But this user does not want to invest time in such an endeavour. This user wants it the easy way. He/She wants to modify the system in such a way that the desktop and its behaviour meet the requirements of this user’s personal workflow, so that one can work efficiently. But this user also does not want to spent much time on the internet to search for solutions of how to configure some of the more normal aspects of a gui. Thus, creating a Power User Community is a step in the right direction. But this step must actually lead to a solution which produces not only a community or a forum or a FAQ or whatever. It must lead to a set of easilty useable options to modify some of the more general aspects of the gui. Please consider this, when discussing a Power User Community. This sounds like the exact …. idea you were going on about last year around this same time when Canonical was making smaller steps to dumb the desktop down. The idea didn’t catch on then and I don’t think it will catch on now. Personally speaking, If I want to say for example, change the auto-hide feature of a panel, I don’t want to have to go into a control panel and 3 layers in to check a box where right-clicking said panel and checking a box would do the same job. Along those same lines, from what others and myself are finding, none of these “advanced features” of Unity you speak of exist in any form besides changing the source code and recompiling. There is no gconf or .settings files for any options people have been asking for. As for the community aspect of this “Ubuntu power users”, tinkerers and “hot- rodders” aren’t always developers as you seem to assume. I like to change a few simple settings in my gnome 2.x desktop to suit my needs, but I cannot develop my own feature or widget. Who is going to spend the time developing these tools for us? Certainly not Canonical. They are too busy dumbing everything down and it would certainly be a conflict of interest in the different development teams. The only option I see going forward is a complete fork Ubuntu with the gnome 2.x DE or maybe just the DE itself as another varient of Ubuntu. Unfortunately, I do not see that happening due to most of the really motivated people capable of such a feat having moved on to another distro away from Ubuntu or simply just don’t care anymore due to their expectations being constantly shattered by Canonical. Indeed, this is the same kind of idea, but I didn’t have much time to invest in getting it off the ground. I am keen to identify people who are interested in helping to run with it now. “Along those same lines, from what others and myself are finding, none of these “advanced features” of Unity you speak of exist in any form besides changing the source code and recompiling. There is no gconf or .settings files for any options people have been asking for”. Agreed that Unity is lacking in some features, but there is no reason why some more configurable functionality could not be exposed to Unity at a lower level and exposed by something such as Gunity. My suggestions here are purely that some parts of an Ubuntu Power User community could do some development work, others could do docs, others could do packaging, and others could do advocacy. There is no single persona here. “As for the community aspect of this “Ubuntu power users”, tinkerers and “hot- rodders” aren’t always developers as you seem to assume”. I am not assuming people have to be devs. As I outlined in the post, we could have a place for people to communicate, people could package existing advanced configuration tools, others could indeed do development etc. “The only option I see going forward is a complete fork Ubuntu with the gnome 2.x DE or maybe just the DE itself as another varient of Ubuntu. Unfortunately, I do not see that happening due to most of the really motivated people capable of such a feat having moved on to another distro away from Ubuntu or simply just don’t care anymore due to their expectations being constantly shattered by Canonical”. You can install GNOME 2.x on Ubuntu today (in fact we provide a Classic Session out of the box). There is no need to fork Ubuntu – just install the relevant packages (and the Power Users team could provide awesome docs and support for doing this). My goal with this blog entry is to demonstrate that motivated people around such needs could form a team and build on an already strong Ubuntu ecosystem and foundation. Is this something the DX folks would actually consider? There have been patches available for notify-osd adding configuration options for quite a while. These have been rejected with the reason that adding configuration options adds more code paths that create a maintenance burden. It would also add a burden to testing. @toros I think Ubuntu needs a default tool like Gunity. This should be installed by default. @Mike Tushton (and @all) I am glad that this time I am not the “bad boy” who complaints about Canonical/Ubuntu moving away from their old user base. But indeed, I agree with you: Canonical is not trying to expand their user base but instead they are dropping many of their old users and are replacing them with new ones. Best example is the debate about the possibility to add an option to move the launcher to the right edge, or the bottom of the screen. (Found here: https://bugs.launchpad.net/unity/+bug/668415 )There are many voting for this feature to be implemented. But instead you get no response. And if there is response to the request, then they say it is a “design decision” and mark the request as “won’t fix”. Canonical should really think about the way they are dealing with their community. At the moment it appears to me that they do not want to have one. I have looked at various bug reports regarding the above issues and next to all of them have been closed as “won’t fix” citing design reasons. 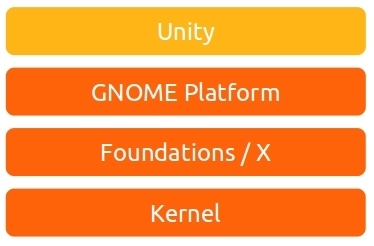 The flexibility I would like to keep from legacy Gnome is nowhere to be seen in Unity. I also noticed when reading through the usability tests being done that the test persons were all Windows, OS X users and newbies. There wasn’t a single existing experienced Linux Gnome user nor any interest in how such a user would react to Unity. My view is not that all we are missing are some config tools and Unity is good to go for power users. Design decisions in Unity isn’t at all compatible with principal power user features used for decades, like focus follows mouse. I strongly agree with this plan. Both the need for it, and the way of achieving it. I would however add, that I feel to attract 200million users we need to offer something noticeably different to the commercial offering. And for me what has always been important is configurability. This gives a sense of ownership of the complete system that commercial vendors can not offer. I know many non users feel Linux requires complex command line understanding, and we need to prove, again and again, it is simple and just works. But this should not remove the need for simple GUI tools to customise the UI. Not all Fords come in black these days, people like to personalise. Unity has a great potential, and we just started to explore the possibilites. The example of Unity 2D shows that it is even possible to create an alternative interface based on the “foundations” of Unity. @HoellP Interesting…. I am not quite sure, but as far as I know, the idea of a community is not try to integrate people. Instead you are talking about leaving “intermediate users behind”. Certainly one cannot satisfy all needs somebody might have, but perhaps one should at least try to consider integrating as many people as possible. Did you look at the link of the launchpad page that I was referring to? There are currently 73 votes for the feature change. The “hotness” of the bug is 348. This put it at place 30 of the unity bug, if you sort them by hotness. Place 30 of 1617! And the bug is not even shown on the list because it was marked as “won’t fixed”. Indeed it was said at first, when the bug (i.e. feature request) was posted that this is only a request by some users. Those that you would call “intermediate user”. Seemingly it is not so good to exclude some so quickly as it seems that there is some validity to the claim that something should be changed. To point it out again: no. 30 of 1617 (if the bug were counted among those listed on the list of unity bugs). I think i was not as clear as i thought i was. If there was a power user community which, in one way or the other, produces it’s own tools, than it should naturally provide a way for a subset of the settings to be usable by the non-power-users which are still interested in changing the UI. That’s why i made the example of simple- and ccsm. Both change the same settings for the same program but with different levels of complexity. I was merely referring of posters before me, which seemed to worry that this would be some kind of elite group, only scratching their own itches. As to the article, no i hadn’t read it when i wrote my post, because we wrote our’s at the same time. I know at least a part of that discussion and just skipped to the bottom for now. Does that mean that changing launcher position is a won’t-fix for oneiric as well? Reading Mark’s very early statement i thought there was a possibility it might change within a bigger timeframe, If someone finds a solution to keep the whole screen consistant with it. Still, such ui-breaking change might just be possible in a ubuntu-poweruser-addon. There was a proposal to create a PPA which included a package that, after installation, would allow the Launcher to be used. 2) it was left to an ordinary user/developer who is not part of Canonical. So this is certainly a great method of Canonical: to get other people do the things you need. This is what I mean: Mark and his desciples want something and it is done. If the rest wants something they are rebuffed. Well, I suppose I will switch to the mailing list, which Jono proposed. Perhaps I can at least participate at this debate and hopefully I can be part of some nice and useful output. Creating resources (Documentation, HOWTOs, etc.) and giving support (forums, irc) for like-minded users. Helping 3rd party developers (who create configuration tools, indicators, lenses, etc. ): offering them testing, creating documentation, helping in localization, spreading the word about their efforts. 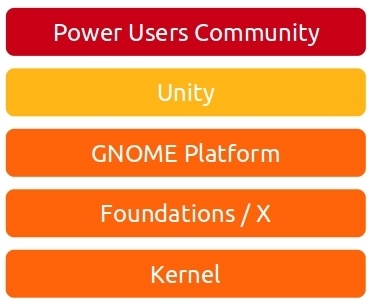 Basically, the Ubuntu Power User Community could connect the Unity project, small 3rd party projects and the advanced users. Quick update: there is now an ubuntu-power-users mailing list you can join at https://lists.ubuntu.com/mailman/listinfo/ubuntu-power-users where the community can participate. Hi Jono, a couple of my friends and I have all had a chance to play with Unity now, and it it not really oversimplification which any of us were troubled by. To be clear, our biggest gripes were different for each of us, but mostly it came down to three new UI changes. 1) The global menus that only appear on mouse over. 2) The poorly designed lens system that makes users click through so many layers of needless and sometimes random lists in order to find the icons the old app/folder menus used to present up front. 3) The accordion-like way the launcher folds up on spillover – it obscures information and gets crowded too quickly. On another note, I think using the launcher for basic system functions like the virtual desktop zoom out and app browser is a mistake too. Those functions should be launched from the panel, or from some overview like Gnome 3 has. Good luck on the power user group. I think that creating a place for the “power user” is a great idea, but at the same time I can’t help but notice the lack of support for the “newb” as compared to another company that starts with a “G,” I love the “Ubuntu” operating systems, but they do so much thats it’s still easy for the newbie to get lost. I understand the “roots” of the Linux operating system is in the power user, but if the motivation of the “Unity Interface” is to bring in the average user (I love Unity by the way) then I think much more work needs to be done. In my part of the country, the main group attracted to “Ubuntu” are the lower income and thus less educated parts of our society. Thanks for Ubuntu! good post…..interesting comment…if you are sick and tired of living paycheck to paycheck and want to break free of the rat race….if you are looking for the perfect home based business which is not MLM and involes no selling then you need to visit this site today http://www.road2cashnow.com. Here’s a simpler way: Install Debian. Troll? Maybe not. Ubuntu is the most famous Linux-Distribution not because it appeals to linux-pros and power-users, but because it is great for people who do not wish to configure their system, who do not want to be scared by too many possibilities, when all they want to do is work with this system. It was the first Linux I used exactly because it does this thing very well. Unity is just another step in this direction. Its concept is clearly in opposition to power-user-concepts as KISS for example. So why try to use Ubuntu for something that is not its goal? Isn’t this the great thing about the Linux world? There is a distro for every kind of user. Agreed, that is why I switched to Fedora 15 (KDE 4.6) this weekend. I dont hate Ubuntu, just dont want to go in the direction they are taking. So… so long Ubuntu it was grand (2005-2011), take care and good luck. Great post, Jono! I agree with you completely, and love Unity (it has its issues, but for a first iteration, it is amazing, keep up the great work). I feel like a true power user already has the ability to get under the sheets and install compilers, UI-tweaking tools, and whatever else you can imagine. Of course, your idea for building up a community/documentation/best practices for how to do this, and making the process more streamlined is great. I am a developer and definitely a power user, but I also love simplicity, and when I want to develop, I just want to go into my terminal, load up vim, and get to work. The rest of the system should stay out of my way until/unless I want/need it. Just my 2 cents, keep up the great work. How about an unobstructive advanced user option during the installation which would open a page where you could choose packages? Also, a power user would more likely just choose to use another distro at this point. The alternate installer has had this option for as long as I remember. Pragmatic power users who want a full desktop environment use Kubuntu, not Ubuntu. The GNOME philosophy guarantees that tweaking anything beyond basic desktop settings will tend to be difficult, obscure, or sometimes impossible. To gear it towards advanced usage you can slap whatever tools you wish on top of it, but now you’re not only adding power features but also unnecessary complexity. It’s more practical to build on top of an environment like KDE which is designed with power users in mind. I’m a pragmatic power user (or guru) who absolutely hates KDE. I’m not using Kubuntu. If find it more difficult, not less, to get my system configured the way i want it in KDE. It’s not for lack of effort. I don’t see how the novice users in my house could like it either. Hi! I think Unity must keep ‘simple’, without configurations, because if it’s simple then it’s easy, it’s clear for all users. Ubuntu is for everybody, then I think ‘less is more’ 😉 Best regards. well as i said to jono yesterday , i’d love to participate to this great idea of creating a power user community! i see a lot of comments about gnome, unity, KDE but don’t you forget that there are others WM, even if not officially supported by canonical, that power users like to use : Openbox for example, awesome. This is a very nice idea! Honestly I would suggest Ask Ubuntu as a platform for power users though. No reason why there could not be a forum – Mike volunteered to make one. There are more than two user communities. How about those with older hardware? Ubuntu is easy to install. Ubuntu is reasonably easy to use, at least for common tasks. But Ubuntu has lock in. Releases become obsolete, and quickly. For the user who does not need, and does not have the budget to upgrade hardware, this is problematic. Hardware that is 8+ years old, but has DDR memory is still at least half the speed of modern high end systems. It’s adequate hardware. But it may not have good video acceleration. So if the new system has Compiz turned on by default, it’s got to be easy to turn it off. Perhaps the right way to do it is for the installation (or upgrade) to detect the graphics card and do the right thing. Then, let the user turn it on (or off) from an easy GUI. I’m not fond of gratuitous graphics. Eye candy is distracting, and i have work to do. I have a Pentium 3 and a brain dead Pentium 4 (uses PC100 RAM) to support. Neither system is amenable to an available usable graphics card, nor is there a budget for it. I have a modern machine, but there are too many people in the house. I’m not happy with the way user switching works, so my hardware sharing needs are not being met. As a linux guru, one irritation i have with Ubuntu is that releases are decommissioned about the time i’ve gotten everything working the way i want it. What i’d like is if when a distribution is abandoned, if it still gets security updates, for like, 10 years. And by security updates, I mean serious security updates. Anything less is irresponsible. Then there’d be no forced march to upgrade, leaving a machine uselessly slow. Without it, i need to abandon Ubuntu. I just upgraded my most capable machine to 9.10. (Not my fastest machine, just with the most capabilities demonstrated: printing, scanning, sound, Flash works, Java works, sound editing, video processing, and so on, and so on). I delayed quite awhile. I’m seriously not happy with the result. This machine won’t be upgraded to the 10. * series. The machine is already 10 years old. I’m expecting at least five more years, if not ten, from the machine. Quick update: so we now have a mailing list (https://lists.ubuntu.com/mailman/listinfo/ubuntu-power-users) an IRC channel (#ubuntu-power-users) and discussions are going on to get the wiki pages in shape and discussing different configuration tools and how a single configuration app could be awesome. I just couldn’t resist…and its not meant to be a troll…just a humorous reaction to the blog title. heh heh. Most people migrate to a more suitable distro when they graduate as “power users”. Ubuntu is just serving as a gateway distro. Anyone who uses Ubuntu (by choice) and considers his or herself a “power user” is sorely mistaken or desperately in need of enlightenment about the various considerably superior distros out there. Ubuntu will never reach it’s target of 200 million users. If you manage to drive adoption that high, competitors will start to take notice and do whatever it takes to grab a chunk of your user base. Ubuntu doesn’t have the man power or the talent to differentiate itself enough to stand alone. You are too idiotic for words. It wasn’t a troll. Power users should be configuring with the command line and using a fitting distro. Ubuntu quite simply isn’t a power users distro. On browsing the Ubuntu forums, it appears to be more of a support group for mentally handicapped 13 year olds. I think must keep it ‘simple’, without configurations, because if it’s simple then it’s easy. You’re missing the point, Jono. The point is, there wasn’t a problem until the teams at Gnome and Ubuntu decided to create one, and we naturally tend to blame the people who created the problem, even if they have no duty to serve our needs. And you don’t have a duty to serve our needs… but you did create a problem for a great many people.